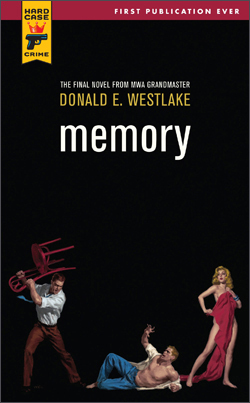 Billed as Donald Westlake’s “final novel,” Memory is actually an early novel, written in the 1960s but never published, by the great mystery and noir writer. Following the writer’s death in December 2008, Hard Case Crime publisher Charles Ardai announced the aquisition of this unpublished work, which had been rejected by Westlake’s agent early in the writer’s career. Memory, in fact, is barely a crime novel: it begins with a crime, and it does have a noirish feel; plus, there is something of a mystery involved. Police occasionally get involved. But it hues closer to a late modernist meditation on identity and its connections to memory than it does to the crime novels that would become Westlake’s stock in trade. It’s like a Virginia Woolf novel without the formal experimentation or stream-of-consciousness style, or Kafka minus the nightmare landscape. The next paragraph begins with a nurse looking over Paul, and in the gap between the two paragraphs is a loss of memory that Paul will never recover. It’s a nice stylistic trick that Westlake pulls off here because, on the first page of the book, the reader is disoriented in a way that mirrors Paul’s experience and puts the reader in a position of sympathy with the protagonist. Also in that gap, Paul sustains a head injury that causes not traditional amnesia, but a gradual loss of memory that removes not only his past before the injury, but most new memories that he accrues after. Paul is discharged from the hospital with very little money left and a sheriff on his back who wants to see the adulterer run out of town. Though he cannot remember much of his past life, he knows from the identification in his wallet that he is from New York City, and the thought of returning to his home in hopes of triggering his lost memory drives Paul forward. With what little money he has, Paul buys a bus ticket to go as far east as possible, which means the small town of Jeffords. In Jeffords, he tries to find a way to earn the money that will get him to New York, but due to a series of mistakes resulting from his gradually declining memory, this process takes months. Meanwhile, he builds a nice life for himself in Jeffords: working in a tanning plant, living in a boarding house with a nice couple, making friends, and building a romantic relationship with a young woman named Edna. However, the need to return to New York constantly nags at him even when he forgets exactly what he wants to find there. The pieces of his life in Jeffords remain with Paul, even as he tries desperately to rebuild his past while also attempting to retain the new memories that he makes. Paul starts writing notes to himself to remind him of the most mundane details of his life, but as his memory regresses, these notes take on a more cryptic quality to him. Like a character in a Kafka story, Paul also faces a hostile world where government bureaucrats are indifferent to his problems and every barely-remembered friend could be a potential threat waiting to take advantage of his condition. Westlake builds sympathy for his protagonist by building up hope that the lost memory will eventually be recovered. However, as Paul loses even the memories of events that take place in the novel itself, the likelihood of that recovery diminishes. In Paul Cole, Westlake created a compelling protagonist. As he tries to piece together his past, he sees a brash, young actor on the verge of career success that sharply contrasts the quiet, insecure amnesiac that he’s become. While Memory is by no means Westlake’s best work, it is also far from a failed early novel that deserved to be languishing in the bottom of a drawer for 50 years. Fans of Westlake will see early signs of his strength as a novelist while also getting a dark novel that doesn’t quite fit with the rest of his considerable oeuvre. And although the novel holds up on its own as a compelling read, those new to Westlake might be better off starting elsewhere, especially with one of the other great Westlake novels that Hard Case Crime has resurrected, like 361, Lemons Never Lie (written as Richard Stark), Somebody Owes Me Money, or The Cutie.